Scalability is an issue that faces practitioners in systems and design. How do we design systems at scale and if so, what might they look like. Charles Leadbeater has been on a mission to find ways to make large organizations — particularly those in the social sector – more innovative. Leadbeater, like many social innovators, is hard to pin down to a single title or role. He is at once a researcher, a designer, a systems thinker, and a urbanist. Like most innovators, all and none of these descriptors truly fit. Leadbeater was in Toronto earlier this week to speak on the issue of innovation in cross-sector collaboration for public good at the MaRS Discovery District. If you’ve seen Leadbeater speak (consider the talks on TED here or elsewehere), you’ll know that you’re in for some English-style self-depricating humour alongside of much about the manner in which people engage in change actions within a system. You’ll also get a lesson in social design, the kind that Victor Papanek advocated for. To my delight, Leadbeater did not disappoint. Unlike other talks, the value came less from a focused “take home message” and more in a way of conceiving social systems through the combined lens of systems and design thinking (my terms, not his). At the heart of his talk was the challenge we face with building systems and empathy at scale. When things interact, eventually they become understood within a set of boundary conditions and interact, thus making a system. The system in turn begins to establish rules (or rather, the rules determine the system). These emergent properties thus shape the way the system operates or, in social situations, governs or guides the actions of those within it. The problem is that at certain scales the very factors that create positive social relations, that is those that yield tangible emotional, resource, or informational benefits for one or more parties, get warped under the changes in that scaling. Thus, we have the countless stories of a beloved small business grown in a confined community that becomes a multinational corporation and, in doing so, loses the intimacy and connection to its customers in the process. Companies do this, government organizations show this, and so do cities. The more one designs for the humans within the system in ways that create meaningful engagement, the greater the empathy. Yet deep empathy is often founded upon intimacy, which is something that is difficult to scale. Leadbeater illustrates the various ways in which firms and cities have addressed this on the graph above. In each case, there are examples that fit. In business for example, there is Ryanair, which embodies a highly structured system with low empathy (top left corner). Opposed to that is the local farmer’s market where one gets to know their grower, experience high mutual empathy, but in a manner that is unique, idiosyncratic and non-systematic in most ways. The challenge is how to design organizations at scale from the cosy-ness of the Farmer’s Market without becoming a Ryanair. It struck me that the food service industry might be one of the areas where the scalability can be achieved. For example, Starbucks is a gigantic corporation with shops worldwide, yet it still manages to create a very homey, local feel at each one. In the mornings I go to the gym I stop by a location to get a smoothie and my server always remembers my order. At the location near where I take classes, they gave me a free drink because they couldn’t get the computer to take off my 10 cent reusable cup discount. In each location, the benefits were not just in customer service, but in the chit-chat and relationships that I develop with the staff. It’s not like I am speaking to owner-operators at some of the great independent coffee shops around my city, but it is close. The Starbucks experience was thought through, intentional and thus, by design. We can do this with other systems. The key is whether or not the systems themselves are aware enough to know when they have, indeed, become systems. Starbucks today could not be empathic in exactly the same way as it was when it was a one-shop place at Pikes Market in Seattle. But it can create something similar, which is parallel to Simon’s notion that design is about the science of the artificial. I’ve been developing and advocating for an approach to creating scale — in time and scope — that I call developmental design. A developmental design approach means shifting and changing over time and designing things in a manner that adjust to the complexities associated with dynamic systems. It brings together complexity, systems, design and the detailed feedback mechanism that comes through developmental evaluation. 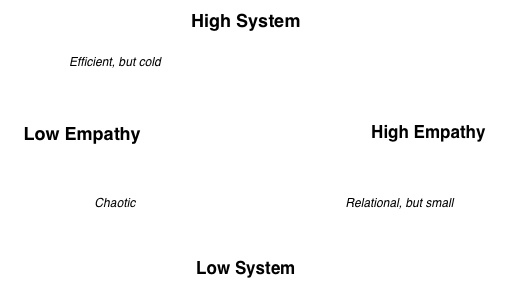 Leadbeater’s grid helps add to this concept by giving a focus to the development, from one level of empathy to another and one systemic scale to another. Through thinking in systems and acting through design, perhaps then we can create the kinds of services and organizations that respond to the challenges we face. And designing for empathy will help us know when we’ve achieved it.